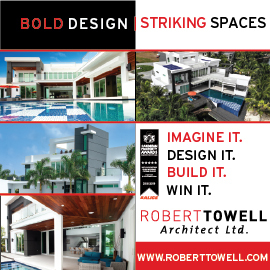 The world-renowned "architect laureate" of the Caribbean has designed homes and resorts in over 20 countries. Founding Lane Pettigrew Associates in 1985, his West Indian aesthetic blends traditional styles and modern comforts and technology with award-winning results. As a boy in Caracas, Venezuela I was always reminded of design and architecture by my grandfather who was a well-known architect in the Caribbean at a time when going from Barbados to Trinidad involved a boat and three days travel time. My grandfather had completed prestigious projects in Caracas like the Valle Ariba Country Club, the Circulo Militaire and the Tamanaco Hotel, and I was always very proud to be in spaces he created. I got the sense that architecture was a career that used creative energy to build spaces that people used and enjoyed, like notes of music being carved into sculptures. When I learned that my great grandfather had also been an architect, there was never any question in my mind about my calling. The question of style is one I avoid, as every project is a deliberate and measured response to the client, the brief, the site and its location. As a rule though, each design is governed by the maximum use of natural materials, pleasant spaces and relaxing atmospheres. LP: I am involved in six projects in six different Caribbean countries, which seems to be a typical year for me, from our 2010 IPA award-winning Sugar Beach Residences in St Lucia (Best in the World) to our newest creations, Zemi Beach on Shoal Bay in Anguilla and Amber Dune in the Caribbean’s funkiest beach town, Cabarete, in the Dominican Republic. Amber Dune brings cutting edge Caribbean design, wired and green to a new generation of visitor. Every year I take on two private homes, and this year is no exception, with one in Dominica and one in St Lucia. What is the new direction in architecture? Natural, green, clean and wired is how I would describe the movement now. How have new technologies helped you? I travel very light. For years, I carried boxes with models, presentation boards and rolls of drawings on and off those wonderful LIAT flights, but now I just have a laptop and a mini projector. The Rainforest Spa at Sugar Beach in St Lucia is the project that pushed me to new boundaries of creativity and gave me a chance to learn centuries old Indian building techniques at the same time. My research in Guyana, Brazil and Suriname to learn this type of handmade construction using only materials harvested on site and shaped by hand with primitive tools can only be described as life changing. I recommend time in the Amazon jungle to every designer aspiring to be green. It was like living in a fantasy world that, with the help of some Rasta builders, came to life – built into a river valley in the treetops and among the boulders. Now it’s a dream I can share with everyone. Good people, sites with views of the sea and kind attitudes that are tolerant towards all possibilities.